It may be hard to believe, in an election cycle as polarizing as this one, that there are actually still voters out there who are torn between voting for Democrat Hillary Clinton and Republican Donald Trump, despite their vastly different views, personas, and rhetoric. But these folks exist—not just in those awkward panels on cable news after each debate, but in America. And they may decide the fate of the November election. So, who are these curiously uncertain Americans? Two studies by respected marketing firms delved into their strange, turbulent world. A recent study by the ad-tracking firm Ace Metrix measured decided and undecided voters’ reactions to political ads. 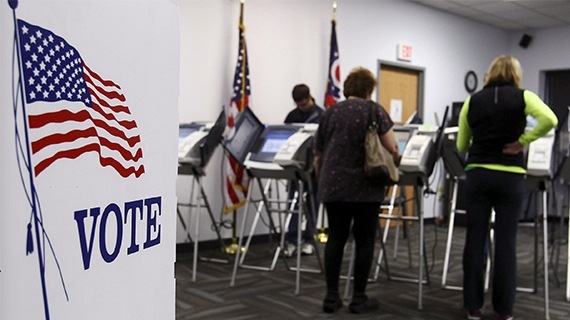 The firm surveyed roughly 1,500 voting-aged US citizens—who were in line with the US population in terms of gender, age, and income—each week since the Democratic and Republican conventions concluded in July. Another study of decided and undecided voters, by Dentsu Aegis Network’s digital-creative agency, Isobar, used emotional, behavioral, and cognitive sciences to measure their motivation. The study combined interviews with rapid-image selection to get inside the minds of voters who were on the fence between Clinton and Trump. Isobar showed its 773 participants images designed to reflect emotions like anxiety, freedom, or frustration, and had them rapidly select the ones they most strongly associated with a Clinton or Trump presidency. They then went back and asked the respondents to describe what those images meant to them. The exercise was repeated to study what voters expected, experienced, or hoped to get out of four years with either candidate as president. Roughly 6% of registered voters who plan to vote said they were not sure who they would vote for, according to the most recent online survey conducted by the research firm YouGov. Other recent polls have estimated the number of undecided voters at anywhere between 0% and 16%. Ace Metrix’s survey similarly found that about 10% of its overall sample were undecided and trying to choose between Clinton and Trump specifically. These voters weren’t gung-ho for either major party candidate, but they planned to vote for one or the other of them. Isobar’s study grouped the undecided voters it surveyed differently than Ace Metrix. The 773 respondents were asked which candidate they were leaning toward and how likely they were to vote for that person. Of those respondents who said they were leaning toward Trump, about 25% said they were uncertain about their votes. A smaller percentage, a fifth of the voters who were leaning towards Clinton, said they were unsure. Ace Metrix called the undecided voters who said they could vote for either major party candidate “swayables,” and they found that this category wasn’t made up only of independents and those who said they weren’t voting along party affiliation lines. Some self-described Democrats and Republicans also counted themselves among the batch of undecided voters whose votes were up for grabs. These swayables spanned all ages, income brackets, and genders, but were disproportionately millennial males, the survey found. So it makes sense that this subgroup of undecided voters responded best to ads with uplifting messages, like Rebuilding America Now’s pro-Trump salute to the US economy and Women Vote’s “Love and Kindness” spot in support of Clinton. Ace Metrix’s so-called swayable voters were not to be confused with another breed of Americans—who comprised 17% of overall voters surveyed—who say they refuse to vote for either party candidate. Some voters in this group, who Ace Metrix called “rejectors,” were so disillusioned with this election cycle that it was unclear whether they’d cast ballots for anyone. And those who do make it to the polls will likely vote for either Green Party candidate Jill Stein or Libertarian Gary Johnson, the research shows. “That’s a shockingly big number of pissed off people,” said Ace Metrix’s Daboll. This group was mostly made up of independent voters, but also included Republicans and Democrats. Controversies such as Clinton’s email scandal and Trump’s anti-immigrant comments weren’t deal-breakers for most swayable voters, Ace Metrix’s study found. These undecided voters were able to write off some of the unsavory elements of the race, the study showed, because they were more passionate about less volatile issues, such as the economy, than emotionally charged subjects like immigration. The economy was by far the most important issue to the swayables, the Ace Metrix study found, based on rankings of the issues voters said they cared about most. Health care, education, and immigration were also important to swayable voters, but to a lesser extent. Swayable voters also didn’t place much stock in traits such as business acumen and experience developing foreign policy, the study showed. They are looking for an honest candidate with strong leadership skills. That could explain why Clinton and Trump have had trouble locking down this group down: Between Clinton’s foundation controversy and Trump’s refusal to release his tax returns; Trump’s lack of political experience; and both candidates’ tendency to misrepresent the facts, neither major party nominee offers the complete package. This group is essentially weighing who would be the lesser evil. Surprisingly, the only political ads in this study that turned off Ace Metrix’s swayable voters were those for alternative candidates Stein and Johnson, which suggested that these undecided voters weren’t crazy about third-party options either. Stein and Johnson also placed far below Clinton and Trump, on average, in swayable voters’ rankings of the candidates they are considering voting for. “The third-party candidates aren’t viewed as viable alternatives by this group,” said Daboll. That could be, in part, because 60% of swayable voters surveyed identified themselves as Republicans or Democrats. As much as we tell ourselves that voting is based on rational assessments of the facts, we know it’s not true. When most voters get to the polls this November, reason will melt away and the choice will boil down to a gut reaction. So, what’s going on in the fleshy underbellies of America’s indecisive voters? Like most of us, they’re feeling a lot of things all at once—including scared. They may present themselves as upbeat and patriotic, but undecided voters are actually fearful of where the country is headed, insecure about their personal lives and safety, and they feel powerless to change their situations, suggested the Isobar study. That’s why Trump’s campaign, which has harped upon what’s wrong with Barack Obama’s America and how to make it “great” again, isn’t moving the needle with these voters. They need reassurance, not fear-mongering. Clinton, meanwhile, isn’t proposing the radical change uncertain voters are craving—change that would make them feel more in control. The New York businessman has also failed to empower his uncommitted voters, who the study showed felt frustrated, trapped, or imprisoned by the prospect of a Trump presidency. Clinton’s undecided voters, on the other hand, felt strong, powerful, or free. “The big levers here are feeling powerless and feeling insecure,” Forbes told Quartz. “Whoever is most effectively able to deliver on those two things is likely to prevail” with this group of undecided voters. Voters were also motivated by prospects for their own personal achievement, or success. Clinton has done a solid job connecting with people on the issues, Isobar said, but undecided voters leaning toward Clinton worried about losing a sense of personal identity, or feeling like an individual, under a Clinton presidency, the study found. To really sway uncommitted voters, Clinton needs to be more personal in how she communicates, he said. She also needs to explain how she’ll return power to the people, recognize individuality, and bring the country together, the agency said based on its research. We’ve seen her address this a little more in recent months. She placed motherhood at the center of her platform at the Democratic National Convention, for example. By contrast, Trump’s campaign has given voice to the frustrations and angers of many Americans, and made them feel more like individuals. “Trump has created a kind of identity coffer for people like him, people for Trump,” said Forbes. But the Republican candidate has to tone down his anger and reassure voters who are on the fence that he’ll be able to protect and unite the country after the election, Forbes said.